Where has the summer gone? September 22 was the start of Autumn and the weather has changed even in Las Vegas. There is a sense of Fall in the air. One thing that has not changed for us - is our desire to see people touched with the compassion of Jesus! Pat and I have been ministering in India since 1996 and it is like our second home. Our local contacts, who we have known for over 20 years, have requested that we come to do Eye Vision Clinics. Since Pat is not able to accompanying me on this trip, I have invited a friend to join me. 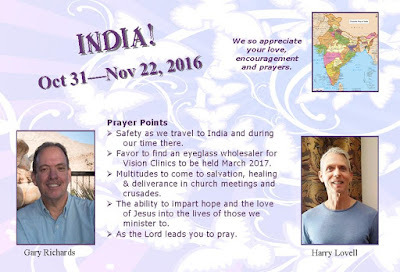 He is a seasoned missionary whom I have taken to India on numerous occasions. This will be a pioneering trip. We will need to find an eyeglass wholesaler where we can buy glasses and optical equipment at a good price. We will also be setting up the places to hold eye clinics in March 2017 when Pat and I plan to return. 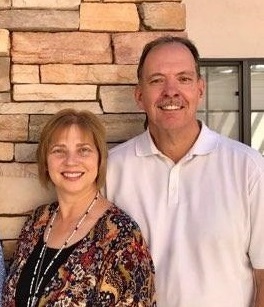 Pray with us that the Lord will bring us someone with a heart to be trained to do eye exams and run the clinics when Pat and I are not able to be there. As you know, Pat and I are not ashamed to ask you to pray for our mission work. We need as much prayer covering as we can amass. An itinerary has been set up for ministry in churches, Bible schools and conferences. The situation in India is changing, with the government's attitudes towards Christianity and funding coming into the country from outside sources making it more difficult to minister. Harry Lovell and I leave for India on October 31st and return November 22nd. I will be posting updates as I can so please follow our Journey With God to India! Thank you for partnering with us and thank you for your prayers!